Roman Holiday is my favorite movie which was set in Rome. The magnificent marble-and-glass baroque ballroom where Ann holds a press conference at the end of the movie is in the Palazzo Colonna, and you can see it, as I did! It's open only on Saturday mornings, from 9:00 AM until 1:15 PM. The entrance fee was €10 in October 2012. Located just two blocks northeast from the Trajan's Column, the entrance is at Via della Pilotta 17, and is a little difficult to find since it's not marked. Just find the doorway which opens into a small vestibule with stairs in the back which lead up to the palace. No photos are allowed inside The ballroom (really called the Room of the Column) and the few other rooms and hallways you gain access to are filled with artworks. The brochure they give you on the way in lists the painter and title of 210 paintings! Numbers below the paintings correspond to the numbers on the brochure. To be honest, I didn't find the paintings all that interesting, but the ballroom was unforgettable. Someone who appreciated the artwork more than me is here. The steps which separated Ann from the reporters (just visible in the bottom-center of the image here) had a rug covering them in the movie because in real life you can see a cannonball hole in one of the steps, with the cannonball resting in it. This was from the French shelling the city from the Janiculum Hill on June 24, 1849. They were aiming for the Quirinale Palace. 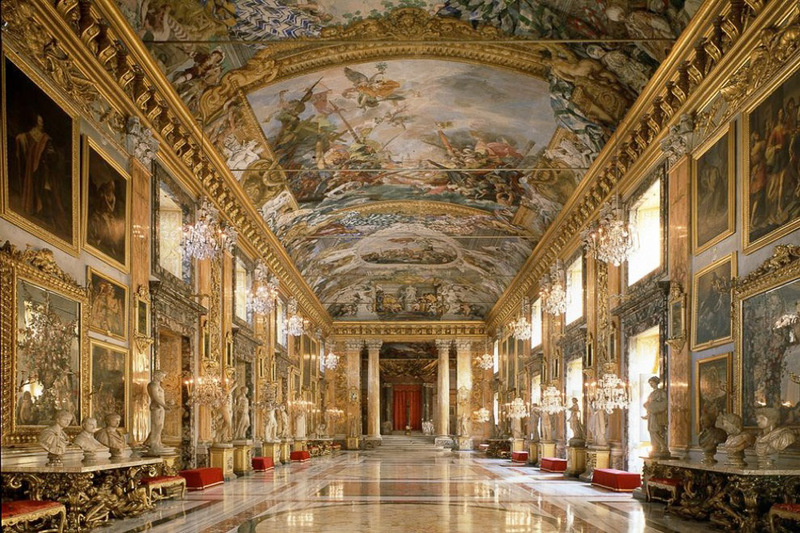 See all Palazzo Colonna photos.